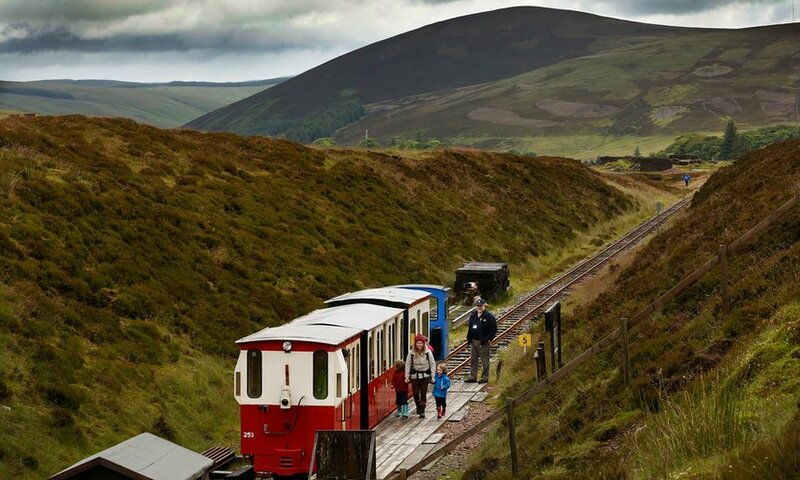 The Leadhills and Wanlockhead Railway (L&WR) was just a weekend-only summertime attraction for tourists – until South Lanarkshire council decided to resurface the only road connecting the two villages. There is no buffet car, the waiting room is a garden shed and only one of its three hand-built carriages is fully glazed. But for one week only, the train from Leadhills to Glengonnar Halt became an essential addition to the UK’s rail network. In a rare, perhaps unique, moment in British railway history, a replacement train service has been put on to make up for a closed road. It is normally the other way round. And this service is run by amateurs. Launched 30 years ago by a small group of single-minded rail enthusiasts high on the barren, rocky moors of south-west Scotland, the Leadhills and Wanlockhead Railway (L&WR) is ordinarily a weekends-only summertime attraction for tourists. Then South Lanarkshire council decided to resurface the only road connecting the two villages that vie for the title as Scotland’s highest. The B797 was to be closed for up to two weeks, cutting off Wanlockhead from the area’s only shop and doctor’s surgery two miles away in neighbouring Leadhills, stopping tourists from reaching the Leadhills mining museum in Wanlockhead and cutting off its lifeline bus routes. So for five days, while road builders re-laid and repainted the B797, the L&WR has run a full weekday timetable for the first time in its history. With ticket prices cut from £4 to £1, it has put on 18 services a day between its two stations, with seven trains timed carefully to meet buses in Leadhills running north east to and from Lanark, and its scheduled rail connections to Glasgow. For Maxine Blair and her two-year-old daughter, Kayla, it is a lifeline. No B797 meant there was no bus for her and her daughter from Wanlockhead to Lanark. So for the first time on Thursday, Blair took the tiny L&WR train from Glengonnar Halt, squeezing Kayla’s buggy into a narrow coach with wooden benches, and no glass in the doors. It is a short trip of just just more than half a mile (1km) between the two stations, with another 500-metre walk from Glengonnar, the site of an old lead mine, down a boggy disused railway cutting to Wanlockhead itself. Its workhorse locomotive, a stubby, blue-painted diesel-powered engine called Clyde, rattles and judders over the single narrow-gauge track at a stately five miles an hour; it hits 8mph on its downhill run back to Leadhills. With the only connecting road closed, the alternative for anyone trying to reach either village is a brisk walk over the moors along rough tracks, or a huge, hour-long detour by car via Sanquhar. “If you’re a bit sickly, it’s not much fun having to make a 50-mile trip just to travel a mile,” said Daren Welch, one of the L&WR volunteers. Carrying several dozen passengers a day, the service has helped ferry shopping and prescriptions from Leadhills to Wanlockhead; on Monday, a courier company dropped off its parcels at Leadhills for another driver to retrieve at the other end. The L&WR is run by volunteers, drawn from across southern Scotland and even in to Cumbria. Welch runs a bookshop 20 miles away in Moffat with his wife and her brother. And like all the other enthusiasts involved, they took time off work, rearranged appointments and mucked in. He was the driver. Its timetable was devised by a supporter who works for the rail-freight firm Colas; David Winpenny, its publicly officer, took three days off from his job as a sales assistant with John Lewis in Edinburgh to run the train from Monday to Wednesday. Margaret Mackay, a trustee at the mining museum, is a volunteer too on the railway but also a passenger, using the train to ferry her to one of her part-time jobs, cleaning in Leadhills for two pensioners. She’s proud of the fame the emergency service has brought the L&WR. “It shows the rest of the country that we’re here; we can get on with things,” she said. Built on the track bed of a railway originally built to deliver lead ore from the area’s mines to Scotland’s ports in 1901, the L&WR is cobbled together: its ticket office, museum and shop in Leadhills is built from two old wooden freight cars; its short platform at Glengonnar is made from weather-bleached railway sleepers and the garden shed, now serving as a waiting room, was donated by a supporter. Its signaling box was pillaged from Arrochar and Tarbet in the Highlands, and built with bricks rescued from a demolished railway viaduct. Heavily reliant on summertime ticket sales and donations, the diesel needed to run the road replacement services was donated too. Only one of the carriages has glass in every window: that is the carriage for wet and windy days. “It’s what we laughingly call first class, because it has cushions in too, from old Glasgow trams,” said Welch. The L&WR at 1,500ft high, claims it is the highest narrow gauge “adhesion” railway in the UK, one which runs like standard trains simply from the friction of its wheels against the tracks, rather than being pulled by cable. The roadworks were completed faster than forecast and Winpenny hopes the publicity and goodwill its voluntary services has brought could also help with one important but under-reported campaign. The L&WR is trying to persuade the area’s landowner, the Duke of Buccleuch, to lease them the remaining 300-metre-long cutting from Glengonnar Halt so they can extend the line much closer to Wanlockhead. “This is what it’s all for, for me, it’s connecting communities,” Winpenny said.